A while back, I was walking out my front door on a super nice, sunny, HOT day. I stepped off my front porch and was met with this huge surprise. Well, raindrops at least. It was completely sunny, and I was being showered upon. My first thought was… sprinkler? But we don’t even own a sprinkler, let alone a sprinkler system that could come on by itself. No, it was coming from the sky. High above me, this beautiful white cloud was raining down happy tears onto my head. But at that moment, I felt joy. It was like God was saying that sometimes he brings rain to help us grown by way of storms that rock us to our core. We’ve definitely been through many of those these last few years. But other times, kinda like a Daddy surprising his kids for no particular reason at all, he brings us showers of blessings just because He loves us and wants to see us smile. I’ve felt that way lately. They haven’t been huge blow me off my feet things. But little beads of encouragement that make me want to run to my Jesus and give him a big ol’ hug to show Him how much I love Him back. 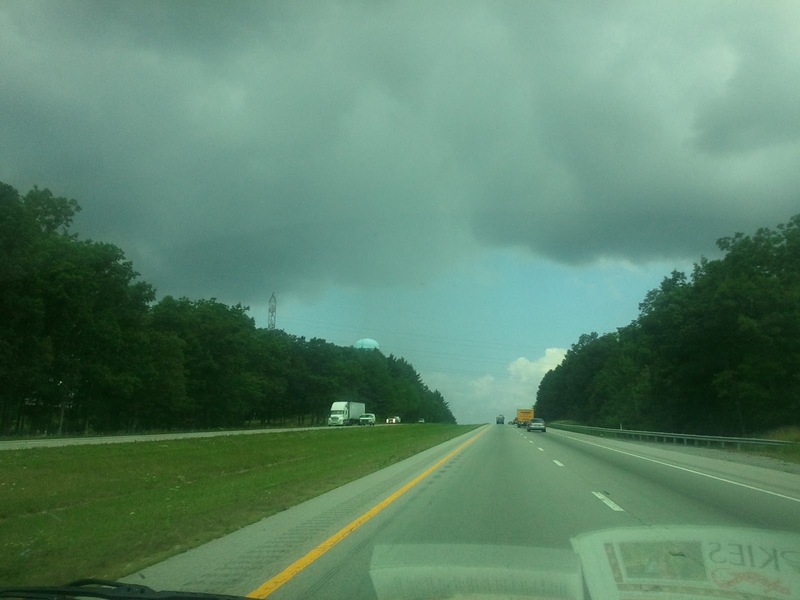 On our way back from our minivacation last month, we ran into a patch of rain. It was raining down HARD, yet, it wasn’t storming really. And the bright blue sky was still beaming up ahead. It was just this picture to me that after the storm, God brings sun to help envigorate those plants to grow after the rain. Because we need a little of both, hm? So today, I’m enjoying the little showers of blessings God is bestowing on us. Ignoring any clouds that might be on the way because I know God will walk through us with them too. Yeah, just basking in the precious light of Jesus. Discussion: What showers of blessings has God brought to YOU lately? Or do you feel like you’re in that nasty storm that’s challenging you to your core? Or maybe you’re in a storm but seeing the light ahead, the ending coming? Can't wait to see the pictures of the blessing bags! Thank you for doing them, with all of your spare time and all…. Love and kisses to baby girl! I think God speaks to each of us in different ways. If you mind works in such a way that you see those kind of analogies in nature or other places, then I think God uses that to speak to you. If not, he will find other ways. We aren't all the same, so it stands to reason that he will find unique ways to communicate with each of us. Just like we do with our kids. We learn what makes them tick, how they best communicate, etc., and then we accomodate those differences. But….in any case….I am glad to know that you are seeing some light at the end of the tunnel. I have been in a similar place. My husband was sick for several years, had a liver transplant, then got cancer, and died a year ago this Saturday. The storm clouds grew pretty thick at times, but throughout it all, God was there. He has been holding my hand tightly, and I am doing ok. The sun is beginning to shine again. I will never forget the trials I have been through and they will always affect me in some way. I don't think you can go through something like that without being changed. But some of those changes are good changes and you come out stronger on the other side. I am glad to know you are doing that as well. Thanks for your writing. I enjoy reading your blog and keeping up with Annabelle.